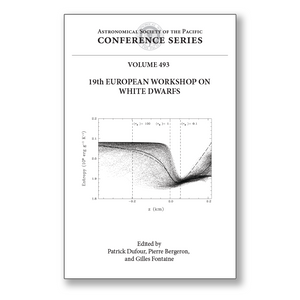 Editor(s): Dufour, P.; Bergeron, P.; Fontaine, G.
The 19th European Workshop on White Dwarfs held at the Université de Montréal, Canada, August 11-15, 2014. This meeting was part of a series of biennial conferences founded some 40 years ago by the late Professor Volker Weidemann at the University of Kiel, Germany, and which now draws participants from around the globe. Indeed, the European Workshops on White Dwarfs have become the most significant scientific gatherings of researchers interested in this type of stars. These proceedings constitute a snapshot of current research on white dwarf stars suitable for scientists and graduate students studying these important stars. The 19th European Workshop on White Dwarfs in Montréal was attended by 130 participants from 21 different countries. A large fraction of the attendees were graduate students and postdocs, reflecting the youthfulness and vitality of the white dwarf community. The main scientific topics discussed were: 1) Atmospheres, Abundance Analyses, and Chemical Composition; 2) Structure, Evolution, and Ages; 3) Pulsating White Dwarfs and Asteroseismology; 4) Disks, Dust, and Planets around White Dwarfs; 5) Fundamental Properties of White Dwarfs; 6) Properties of White Dwarf Populations and Clusters; 7) Physical Processes in White Dwarfs; 8) Surveys: Results and Prospects; 9) White Dwarfs in Binaries; 10) Central Stars of Planetary Nebulae; and 11) Supernova Progenitors and Supernovae.